Do you still use the old infrared contact lenses? Are you finding the best one? Our new products come out on top. The Latest and Clearest Infrared Contact Lenses are already developed. As you can see the pictures on the left side. 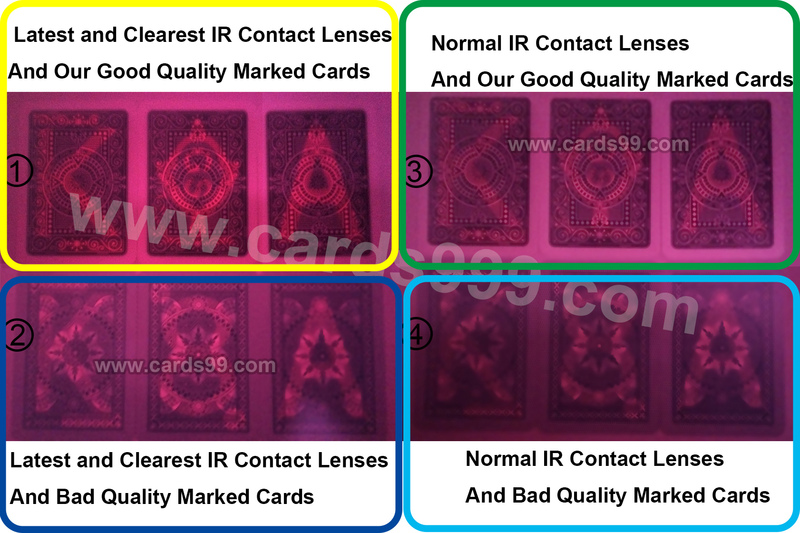 Using the Latest and Clearest Infrared Contact Lenses to see our marked cards (Above) and other people's marked cards (Below), even if other people's cards are bad quality, you can also see more clearly than the normal poker cheating contact lenses. If you use our latest and clearest contact lenses and best marked cards, it can reach a perfect result. Using the normal contact lenses to see our marked cards (Above) and other people's marked cards (Below), you can see our good quality marked cards more clearly. The effect of other people's marked cards is bad, what's more, you can see the mark by normal eyes under the bulb and it will show the mark with red color. They are our new products of 2019; begin production in the second half of 2014. Now, you can own them. They can see the mark more clearly than the normal poker contact lens. Now, the Latest and Clearest Infrared Contact Lenses increase 50% in sharpness, to see both red cards and blue cards. Not only the effect is better, but also the using time is longer than before. Do you believe that there is miracle in the world? Can you image that you can be the best winning hand during the poker gamble?